But we’re climbing higher, as a study finds us consuming more meat than ever before, aided by China and India. A recent study published in the Proceedings of the National Academy of Sciences claims that a global shift toward an animal-based diet has increased humanity’s rank on the food chain. China and India – which, combined, make up more than 35 percent of the human population – are driving the rise in meat consumption. Researchers analyzed data from the United Nations Food and Agriculture Organization – including information on the consumption of 102 types of food across 176 countries between 1961 and 2009 – to calculate a “human trophic level” (HTL). An organism’s trophic level dictates its ranking on the food chain. For example, plants, which make their own food via photosynthesis, are ranked at level 1. Orca whales, highly carnivorous apex predators, top the scale at 5.5. 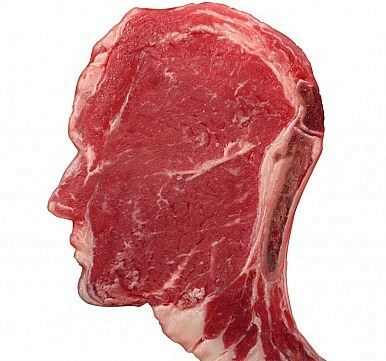 The study placed humans at 2.21 based on the 2009 data – on par with other omnivores like pigs and anchovies. It was the first time in history that scientists have assigned a trophic level to humankind. Although humans may night rank as high as polar bears, in the period between 1961 and 2009, the HTL rose by three percent – a significant increase for such a large population of omnivorous organisms. Although Western countries have seen a downward trend in overall meat consumption – even former U.S. vice president Al Gore recently announced that he had gone vegan – the economic rise of China and India has shifted the paradigm. “As more people become able to afford animal protein, they’ve effectively cancelled out the U.S., Australia and parts of Europe, where meat consumption’s declined over the past two decades,” wrote Salon. Researchers added that the findings are significantly linked to World Bank development indicators – an increase in the consumption of animal protein is often linked to an increase in a nation’s socio-economic environment. As more Chinese and Indians gain access to an increasingly animal-based diet, negative environmental side effects are becoming imminent.